Learn about the zoo, our 50+ year history, and what visitors have to say about us! 1964 – Reptiland opened July 11. Convinced that a clean, well-managed reptile zoo could support itself entirely by those who used the facility, Reptiland was designed around the philosophy that people want to see large and venomous reptiles and learn about them while being entertained. 1967 – Built main entrance building that includes restrooms, gift shop, food operation, office, and living quarters. 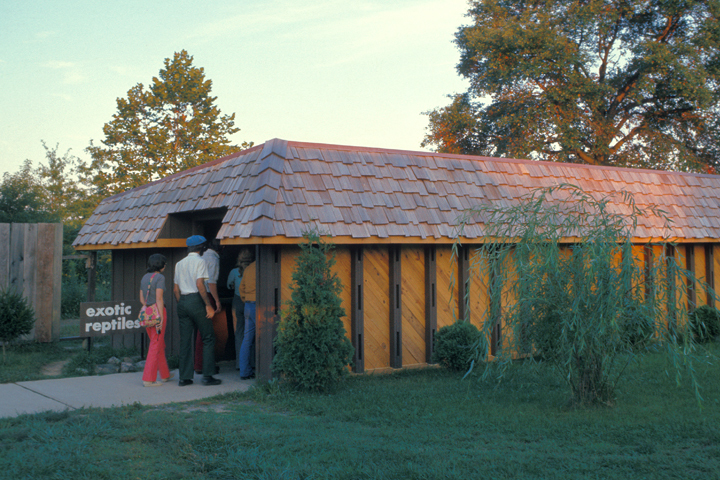 1968 – A new reptile house replaced an earlier and temporary shelter. This new reptile house underwent numerous changes and served our needs through 1995. 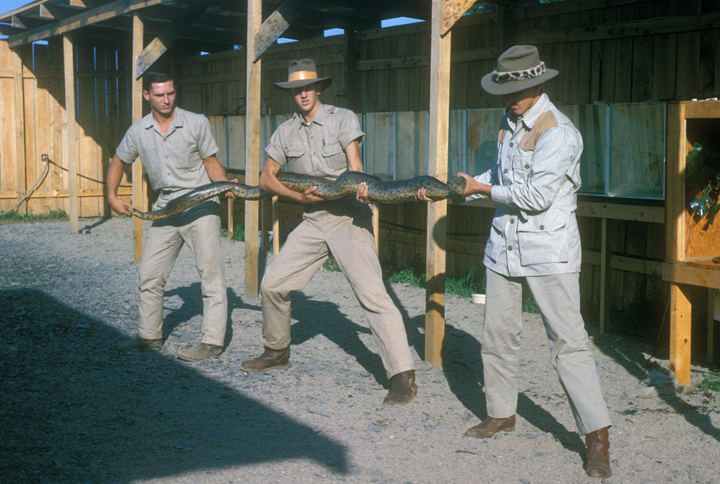 1969 – Constructed a 30’ X 40’ concrete pit in which we attempted to exhibit native Pennsylvania snakes. To our dismay, we learned that meaningful management of the animals was impossible, and we converted this area to a crocodilian exhibit in the mid 70s. 1973 – Clyde led his first photographic safari to the Amazon. 1983 – Developed The Cricket Machine, a coin operated behavioral enrichment device. Allowed visitors to gain a better understanding of predator-prey relationships. 1985 – A tornado damaged much of our perimeter fence and corn-crib style cages, which had been used for mammals and birds. We subsequently developed those areas into outdoor reptile enclosures. 1986 – Accredited by the Association of Zoos & Aquariums (AZA), formerly the American Zoo and Aquarium Association. 1989 – Constructed the Program Center with seating for over 150 guests. 1991 – Purchased and renovated an existing reptile zoo in Catskill, NY. 1994 – Produced a 20 minute multi-image show, The Beautiful and The Deadly, to augment our lecture demonstrations. The Beautiful and The Deadly has since been reformatted into a video presentation. 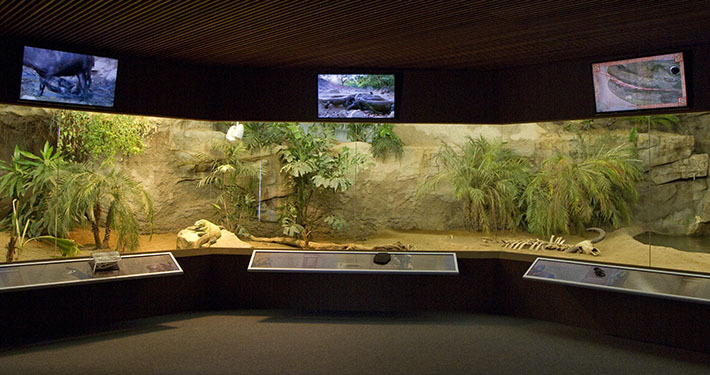 1996 – Built a 5,000 square foot reptile & amphibian complex, allowing us to display the entire collection year-round. 1997 – Held our first fundraiser, Zoo Blues, for the Declining Amphibian Populations Task Force to help with amphibian conservation. 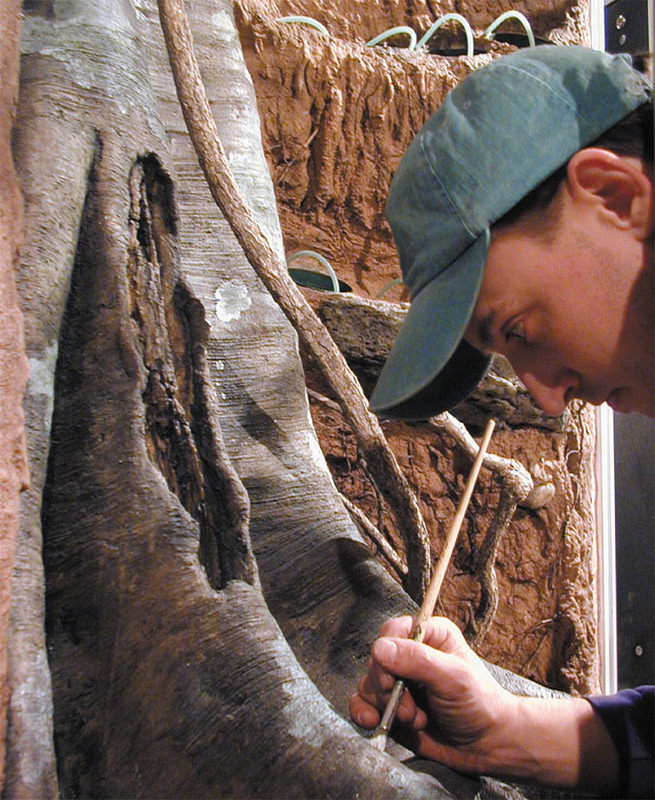 1998 – Made renovations to the Natural Selections Gift Shop and diversified the selection of merchandise to include more education-based products. 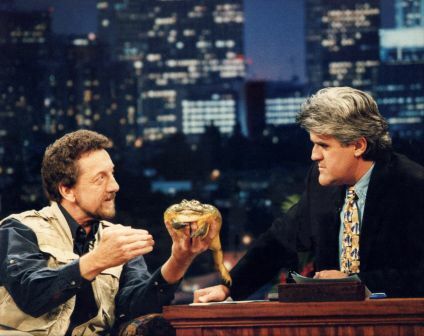 1999 – Celebrated 35 years in business and premiered the first traveling exhibit, Reptiles: The Beautiful and The Deadly, at the Liberty Science Center in Jersey City, New Jersey. 2003 – Frogs: A Chorus of Colors, Reptiland’s second and most popular traveling exhibition, hit the road. 2005 – A second version of Frogs: A Chorus of Colors was built for The Baltimore Aquarium. 2006 – The Scoop on Poop: The Science of What Animals Leave Behind debuted at the Virginia Living Museum. 2007 – The specialized show Venom featuring a cobra, rattlesnake, and Gila monster, premiered at the zoo. Reptiland created the GEICO Gecko Exhibit to promote the conservation partnership between GEICO Insurance and AZA. 2008 – AZA declared 2008 the Year of The Frog to shed light on the declining amphibian crisis. Geckos: Tails To Toepads hit the road for its first venue in Redding, California. 2009 – Reptiland opened Butterflies, a seasonal butterfly exhibit featuring hundreds of native butterflies within a beautifully landscaped greenhouse. 2010 – Chad Peeling contributed to the book Cane Toads and Other Rogue Species. The Natural Selections Gift Shop was expanded and updated to a new, modern look. 2011 – The phenomenally successful exhibit Dinosaurs Come to Life roared into Reptiland. Construction began on a new building designed expressly to house Komodo dragons. 2012 – With the continued success of Dinosaurs Come to Life, we purchased six static dinosaurs to remain on the grounds year-round. Construction continued on Island Giants, the future home of two Komodo dragons. Reptiland’s entrance building started undergoing its first face lift in over 25 years! 2013 – The much anticipated and long-awaited Island Giants exhibit opened to the public on June 14. This exhibit houses our male and female Komodo dragons in a state-of-the-art naturalistic habitat and green building complete with living roof. Reptiland donated more than $100,000 worth of goods and services to local organizations, continuing to support the Susquehanna Valley and surrounding areas. 2014 – Reptiland turned 50! With three kid-friendly events and Reptiland’s first adult-only bash, it was the summer of celebrations at the zoo. The Summer Celebration Series consisted of themed events: Dino Day, Buggin’ Out, and Reptiland Safari. Kids enjoyed fun activities, face-painting, giveaways, and more. Cheers to 50 Years let adults come and raise a glass to Reptiland with free samples from local wineries and breweries, live music, and quality time at the zoo. 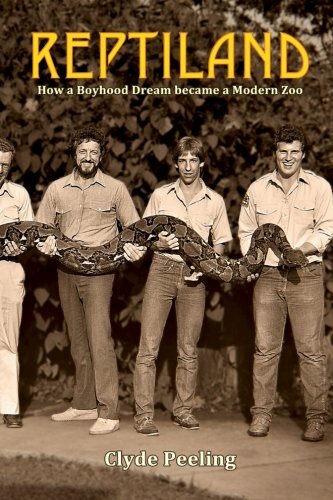 Clyde Peeling also published his book, Reptiland: How a Boyhood Dream became a Modern Zoo. 2015 – Introduced new live shows Lizards & Snakes Alive and The Ruling Reptiles. Hosted Ghost of the Bayou, a limited-time exhibit featuring the rare white alligator. 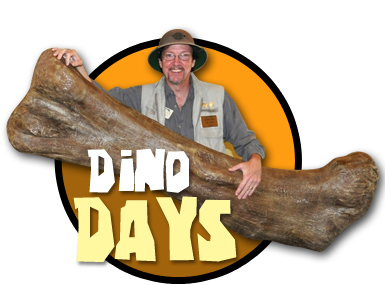 Welcomed Dr. Dino (Chris DeLorey) for our Dino Days weekend in June. Partnered with Wine and Design Williamsport and Genetti Hotel & Suites to host a fundraiser for amphibians; all proceeds were donated to the Amphibian Taxon Advisory Group’s grant program. Our popular fall event, Flashlight Safari, returned for the first time in three years, and we launched our Adopt-an-Animal program just in time for the holiday season. 2016 – Another successful and event-filled year at the zoo! The butterfly greenhouse was converted into a walk-through aviary called Parakeet Landing. This proved a positive change as guests loved interacting with and feeding the 300 budgies in the exhibit. We also hosted three major events, including Croctoberfest, an adult-only fundraiser for crocodilian conservation. This event was generously sponsored by the Genetti Hotel & Suites, included beer tastings from 6 local breweries, live music on Komodo Plaza, a souvenir mini beer mug, and more. Just before the year came to a close, Reptiland Originals, a collection of animal art and prints, debuted in the gift shop. 2017 – Our outdoor dinosaur exhibit now features a Fossil Dig educational play area! Hidden beneath the sand is the cast of a dinosaur skeleton. Using the guide posted on the back wall, you can unearth and identify different parts of the dinosaur. The Fossil Dig was a hit during our annual Dino Days event in the summer. Later in the year, we held our 2nd annual Croctoberfest, which raised additional funds for crocodilian conservation. Around Halloween, visitors joined us after hours for our Flashlight Safari. Since many of our animals are more active in the dark, the Flashlight Safari offers a glimpse of what they do when nobody is watching. A new public path was created by moving the perimeter fence at the south end of the property west, and we also added an entry roof over the north end of reptile house. Read testimonials from people who have experienced all that Reptiland has to offer.